1. Break the cycle of emotional eating. Many people crave food when theyâ€™re not hungry. Take a moment to recognise this and to ask yourself what youâ€™re feeling. I encourage everyone to find a distraction that works for them. This could be anything from doing some exercises to having a chat with a friend. You can retrain yourself to break the habit of eating when youâ€™re not hungry. Itâ€™s a habit that can be replaced by a more useful one that is going to help you reach your goals. Be patient and keep practising ðŸ˜Š. 2. Set some realistic goals. You need to be ambitious but not unrealistic, otherwise youâ€™ll get disheartened. Donâ€™t be tempted to go for rapid weight loss. Yes, you may achieve results very quickly but what happens when you stop doing what youâ€™re doing to get that rapid change? Find a way of eating that is sustainable to you and focus on it being a long-term healthier way of eating. Forget dieting! A realistic goal is Â½ kg a week or 1 pound. Remember itâ€™s not just about weight though so itâ€™s a good idea to take measurements to monitor your progress that way too. 3. Hydrate! It can be easy for us to confuse hunger with thirst so have a drink of water before reaching for a snack. If you are hungry then have a snack with some plant protein. Protein helps to stabilise your blood sugar levels and therefore helps with cravings. Try something like an apple with some almonds or celery with a bit of houmous, nuts and seeds or nuts with a small amount of dried fruit. 4. Donâ€™t resort to diet food. This is a MASSIVE industry, designed to make a lot of money out of peopleâ€™s desperation to get a hold on their weight gain. These foods, shakes and drinks are often full of sugar or very strange sounding chemicals. Weâ€™re designed to eat real food. Focus on eating as many whole plant foods as you can. A wholefood plant-based way of eating can not only help with weight loss and management but there are a host of health benefits too. 5. Meal plan. This will not only mean youâ€™re less stressed not having to make last-minute decisions about what to eat and maybe grabbing less than healthy options as snacks, but youâ€™ll save money and time too. So definitely a win-win! Yes, it needs a bit of time once a week to plan things out, but you will save so much time in the week. No more wondering around the supermarket wondering what to buy. You can go shopping on a mission if itâ€™s not on the list itâ€™s not going in the trolley! If youâ€™d like to know how to lose weight and keep it off without counting calories and missing out on delicious foods. Then book a FREE Take Control consultation call with me today. 6. Forget â€˜Lose 10 pound in 10 daysâ€™, or whatever else you have been promised in the past. Take it slowly. If your body detects a sudden calorie deficit it will want to hold on to the fat as a survival mechanism. Losing weight quickly means youâ€™re much more likely to lose a lot of muscle, as well as fat. As you get older your muscles mass decreases so thatâ€™s the last thing you want! 7. Stick a picture up. There are various ways you can do this. It could be a holiday destination you have planned, a photo of you when you felt comfortable and confident or it could be a picture of someoneâ€™s body that represents the ideal that youâ€™d like to have. You can put a picture of your head on that picture. All of these are visual reminders of what youâ€™re trying to achieve. Itâ€™s all part of training your unconscious mind for success. 8. Get support! Get your family and friends on board. Tell them that you want to be healthier. Do not say youâ€™re â€˜on a dietâ€™. If you havenâ€™t joined my free Facebook community then you can join now. Just click on this link. We would love to see you there. 9. Think about your portions. Weâ€™ve become accustomed to bigger ad bigger portions over time. If you have any older crockery around compare it to newer pieces and youâ€™ll see what I mean. I can see it in the dinner plates and pasta bowls I have. Serve your food on smaller plates or in smaller bowls to trick your brain in to thinking youâ€™re eating a larger helping. Pile your plate with lots of veggies, especially those super-nutritious leafy greens. 10. Get active! It doesnâ€™t have to be much, and you donâ€™t have to go slogging it out in the gym. Do a mix of cardio â€“ where you get a bit out of breath doing something like swimming, dancing or walking, and strength or resistance training to increase your muscle mass. This will help you to not only tone up but burn fat when youâ€™re not doing anything. Bonus! Let me know in the comments if you found these tips helpful and if you plan to implement any of them. Are you ready to tackle your yo-yo dieting for good, so you feel happier and more confident? If youâ€™d like to know how to lose weight and keep it off without counting calories and missing out on delicious foods. Then book a FREE Take Control consultation call. Clicking on this link takes you to my online calendar where you can choose a time to suit you. Once you have booked your call you will receive a confirmation email and further information about what we will cover on the call. Older PostCan My Symptoms Actually Be a Food Intolerance? 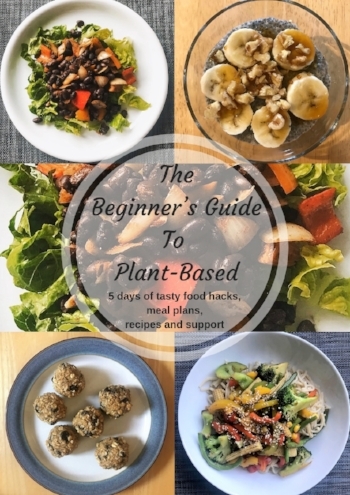 My Beginnerâ€™s Guide to Plant-Based is 5 days of tasty food hacks, meal plans, recipes and support.